Hospitals have become the target of many shootings across the nation and the Bakersfield Police Department have responded to three active shooter calls within a year. 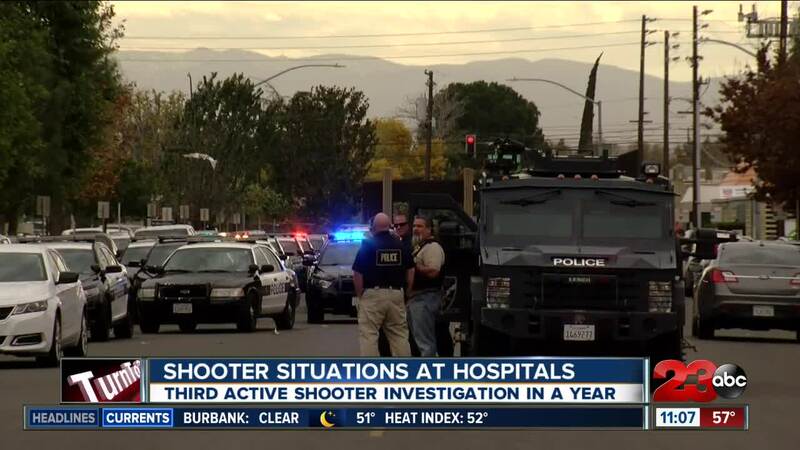 BAKERSFIELD, Calif. — Hospitals have become the target of many shootings across the nation and the Bakersfield Police Department responded to three active shooter calls within a year. On Dec. 1, 2017, an active shooter was reported at the Bakersfield Heart Hospital . Police said the suspect, Brandon Clark, caused panic inside with his weapon. Police confronted Clark in the parking lot within minutes and stopped the shooting. On Aug. 1, 2018, staff at Mercy Hospital Southwest called police to report a possible active shooter. Law enforcement cleared the hospital and there was no evidence of shots fired or any suspects. On Tuesday, Dec. 4 an identical call from inside Memorial Hospital reported a possible active shooter. Law enforcement cleared the hospital and again there was no evidence of shots fired or any suspects.